GRANT Leadbitter accused Bournemouth’s Harry Arter of diving to win a penalty on Saturday. 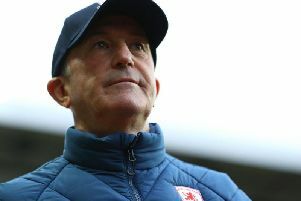 The midfielder felt that Boro were victims of a host of bad refereeing decisions. It was Leadbitter who was deemed to have tripped Arter for the afternoon’s second penalty, and official Anthony Taylor pointed to the spot after a moment’s hesitation. Leadbitter did not agree: “The boy knows that he dived. “The referee’s adamant he hasn’t, which is really disappointing because we’re trying to get that cut out of the game. Arter said: “I’ve never dived and I’m not a diver” but admitted that it could have been his momentum that felled him, as opposed to Leadbitter’s outstretched boot. The penalty was not the only decision frustrating the Boro captain, but he was careful with his words. The former Sunderland man confessed, though, that he and his team-mates turned in a sub-standard display and that they could have no excuses with the outcome. “They’re a good team but so are Middlesbrough. We had an off day. “It’s three points that we’ve lost against our rivals which we don’t like. Quizzed if the week had been good, he replied: “No. We wanted to win three games and take more points than six against our rivals. “It could be a lot better. If we got something out of the game we would have been in a great position. “There’s a lot more twists and turns in the Championship because that’s what the league’s like.